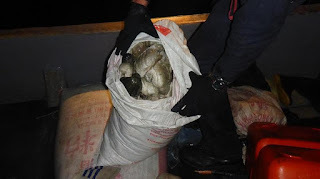 Certain prominent political leaders were allegedly implicated in illegal fishing activities involving the lucrative beche-de-mer (BDM) fishery in Milne Bay Province. However, concerns have also been raised about law enforcement agencies, including National Fisheries Authority, appearing to have been compromised and cannot discharge their constitutional duties with impartiality. These were among a number of serious issues raised at an urgent top-level meeting convened by Governor Titus Philemon at his office in Alotau on Tuesday (Jan 11). “We have a big problem on our hands, not only about foreign fishing boats illegally operating in Milne Bay waters but also our own people engaging in illegal fishing activities,” Governor Philemon told the meeting. He claimed that a member of parliament was encouraging people to dive for BDM in the Engineer Group of Islands when there was a current ban in place. “That’s my biggest concern. How are we going to handle this? People are diving in Woodlark, Tubetube, Kwaraiwa and Anagusa and the NFA and the police are not doing anything about it,” Philemon said. “As governor, I can’t sit back and allow illegal fishing activities to continue. “It’s unfair. The rest of our people are law-abiding and respect the law but a minority, encouraged by certain leaders, are breaking the law. Deputy committee chairman and principal adviser for fisheries and marine resources, Nathan Belapuna, said: “It’s very interesting. The Vietnamese boats know exactly where to go and are targeting only the very rich fishing grounds. “Most of these activities are happening in Samarai-Murua,” he claimed. Present at the one-hour meeting were PPC Chief Supt Joseph Morehari; Provincial Administator and chairman of the Provincial Beche-de-mer Management Committee, Michael Kape; deputy committee chairman Belapuna; Provincial Legal Officer Mea Arua; committee member and PEC Chairman for Commerce, Napoleon Liosi; and several other senior officers.